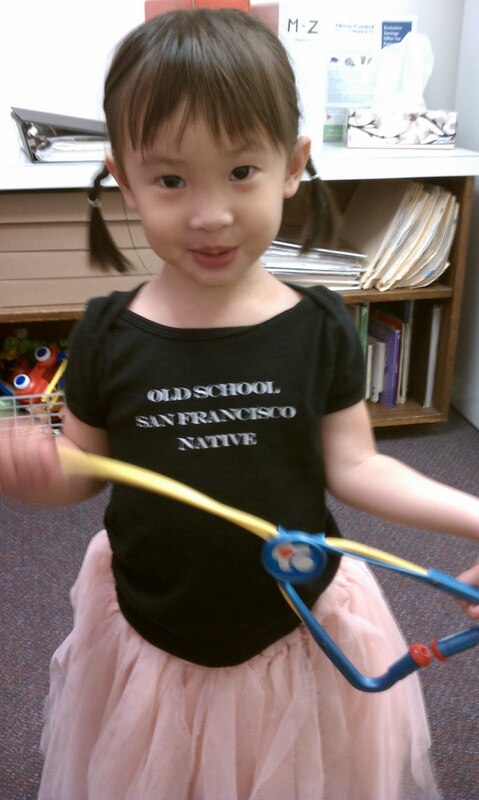 HEY, BAY AREA! LET'S GET READY TO ROCK! Get Allergy Wise is proud to present "Food Allergies Rock!" on Sunday, November 6, at the County Fair Building in Golden Gate Park. 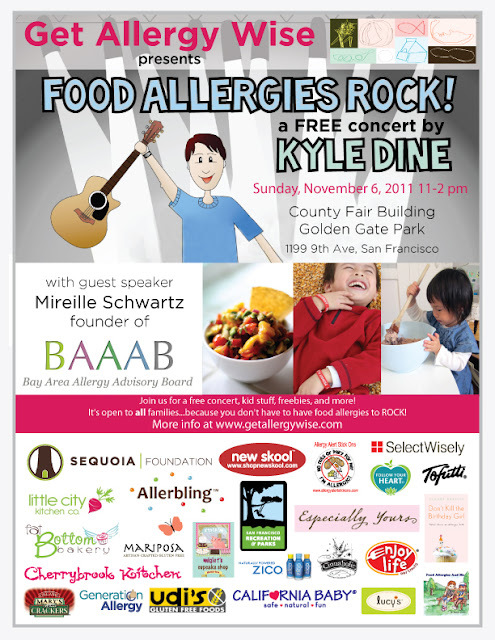 This food allergy awareness event will feature a concert by the world's first dedicated allergy musician, Kyle Dine, an appearance by Mireille Schwartz of Bay Area Allergy Advisory Board (BAAAB), vendor sampling booths, kids' activities, and goodie bags for the first 300 families. This nut-free event is open to everyone, food allergies or not. So grab your air guitars and come on out! Visit our event page to RSVP so you can qualify for our exclusive pre-event drawings. Make sure to include your first and last name and email address. Winners can claim their prizes at the event. Email Sarah at sarah@getallergywise.com or Irene at irene@getallergywise.com. 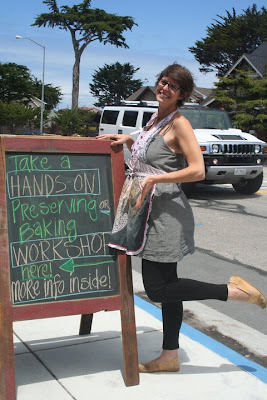 Stephanie Stein is the baker extraordinaire at Happy Girl Kitchen Company in Pacific Grove, and if you're ever lucky enough to stop by and try one of her baked delights, you'll understand why I'm in awe of her. 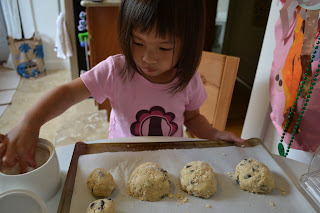 She was sweet enough to share some of her wisdom and her insanely good scone recipe for our egg-allergic families, and I'm so excited to pass it along to you. You are in for such a treat! "I would love to give you some info on egg free baking and such. 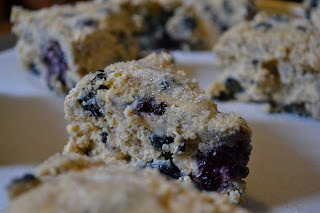 The scone recipe is not vegan, but I have tried adapting it with coconut oil, getting fair results. I have attached a version of it for you. All have many recipes that are either gluten free, vegan, or vegetarian. Get excited about all the alternatives that are available out there. If you are allergic to dairy there are endless non dairy milks to be found. Hem, nut, soy, and rice milks are available at most grocery stores where I live, so I would think they would be readily accessible for you too! Check natural food stores for different flours such as brown rice, spelt, and oat flours... which are also among my favorites. Experiment! When I am teaching my classes I always emphasize to practice, practice, practice. We must not be afraid of failing because what we end up with will ultimately be good enough. Use good ingredients, pay attention, and your end product WILL be good enough. And if it wasn't what you were expecting? Be creative! The other day I made vegan, gluten free snickerdoodles that tasted amazing, but fell oh so flat. What did I do? I mashed them into a loaf pan and ended up making snickerdoodle cookie bars. They were a hit!" *I generally blend 1 cup all purpose flour, 1 cup whole wheat pastry flour, and 1 cup is the wild card. It could be spelt flour, oat flour, almond meal.... whatever you choose. Just a note: When using gluten free flours such as almond flour, quinoa flour, oat flour, etc. I generally only use ½ cup and then a ½ cup of whatever flour I feel with compliment the flavors of the recipe. Preheat your oven to 375 degrees Fahrenheit. In a medium sized bowl, combine all of your dry ingredients, except the oats. This would also be a good time to add any spices or dry additional ingredients, if you are choosing to. 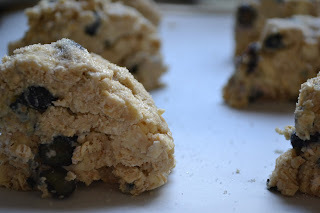 (see carrot cake scone recipe) Once all the dry ingredients are combined, take your two sticks of chilled butter and work them in with your hands or a pastry cutter. The main goal is to not overwork the dough (less is more here!) and get the pieces of butter to resemble oats or small pebbles. Lack of uniformity is ok; you want there to be chunks of butter so they create butter spores in your soon to be beautiful scones. Next, stir in the oats to combine. Now is the time to add any additional whole ingredients that you may want. (i.e. currants, chocolate, nuts, etc) Lastly, pour the buttermilk and gently combine with your hands. I like to bring the dough together in the center of the bowl, almost as if Im centering clay on a potters wheel. By pressing the dough together in the center after you have combined it for a bit, you will have a better idea if the dough needs a bit more milk or not. Cut your dough into two even pieces and flatten both pieces so they resemble about 2 inch high round disks. Dab the tops of the disks with milk and sprinkle with sugar of choice. Cut each disk into 6 even triangles, first by cutting the disk in half and then laying your knife at 1 o'clock and 7 o'clock and then again at 11 and 5. Place on a prepared baking tray that is buttered or slayed with parchment paper. Depending on your oven and the flours you have chosen to work with, the scones generally vary from taking 18 to 25 minutes. They are done when they are golden brown and are fairly sturdy on the outside but seem as though there is still a bit of moisture in the middle. Before Stephanie, I had never before even attempted scones. 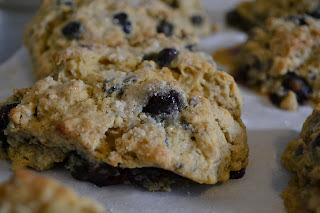 I've since made 4 batches--now I can't imagine not having freshly baked scones around at all times! For my egg-allergic children, this recipe is fabulous! Because Tristan is also dairy-allergic, I essentially make a vegan version by substituting Earth Balance for the butter, and 1 cup of soy milk plus 1 tablespoon of apple cider vinegar for the buttermilk (curdle the milk at the very beginning). I tend to add a little more liquid to the recipe to make sure everything's nice and moist (like 1-1/8 c. soy milk). Turns out perfectly. Once you have a few batches under your belt, you'll positively be a scone expert! Here is my little sugar sprinkler. I was experimenting with round shaped scones here. Conveniently, she always comes round as I'm prepping them for the oven. 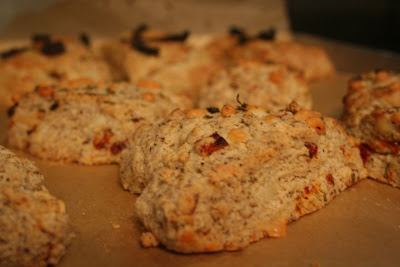 I know I shouldn't be eating scones at 9pm, but this post is making me hungry! Thanks again, Stephanie! You're a pastry goddess! AllergyMoms was started by Gina Clowes, a concerned mom whose son has multiple severe food allergies. The website connects readers to the latest in food allergy research and news, features interviews with medical experts, a blog and a free monthly email newsletter. Its goal is to support the physical, emotional, and social well-being of food-allergic children and their caregivers and empower families with knowledge. I like to learn about current allergy studies but it can be hard to track different studies. Plus my head starts spinning when too many scientific terms are introduced. What I really appreciate about AllergyMoms is that it pulls in food allergy news from all over and translates the research into more understandable terms for the non-science-minded, like me. I recently checked out an archived article on different food allergy tests written by pediatric allergist Robert Wood. The article explained the benefits and limitations of each test better than any of our doctors had! I feel more confident than ever about my choice to do RAST blood tests. Check out AllergyMoms website and sign up for an email newsletter. Ms. Clowes is an author, speaker, coach, and advocate on the subject of caring for children with food allergies. 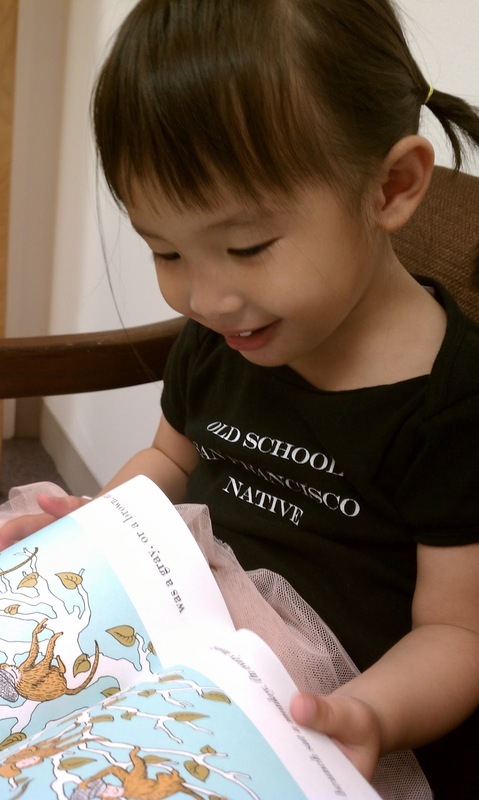 Her book, One of the Gang: Nurturing the Souls of Children with Food Allergies, is available on Amazon.com. I've probably lost sleep with a mixture of anxiety and anticipation over Addi's egg challenge. 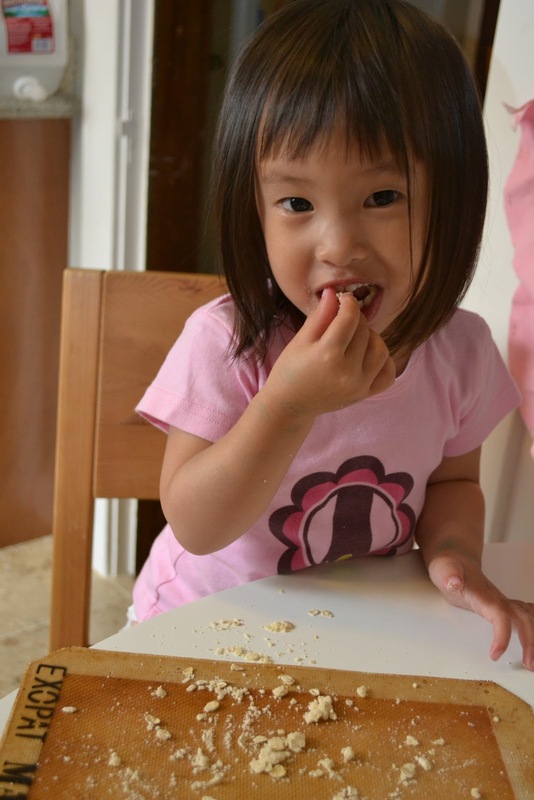 When she was around 15 months old, a skin test showed Addi with an egg allergy. Only by accident did I realize that she had successfully eaten on several occasions foods that likely contained egg white (Chinese fish balls) at a cafe where we ate on a weekly basis. At her two year visit, together with the allergist, we decided we would challenge Addi with egg. 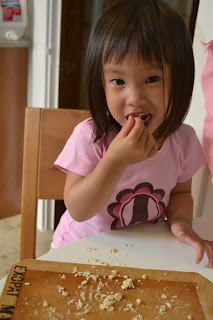 The egg challenge consisted of a two-and-a-half hour block of time in the allergist office, a bag full of toys, markers, and stickers, an egg cooked omelet-style, and her favorite princess fork. Her allergist initially fed her what amounted to little more than a crumb-sized portion of egg, then proceeded to feed her larger and larger amounts a total of six times, about every 15 minutes, until she had eaten a good adult sized bite. and played doctor (I just realized I've been walking around with a Phineas and Ferb bandaid on my sleeve all day!). The result? She was happy throughout the visit (ok, I didn't show you the pics from the last 15 minutes where stir-craziness started to set in and she was rolling around on the floor), and apparently she is a huge fan of egg. A little redness around the mouth, with a few prickly marks, which didn't develop or worsen. So, although there is still some ambiguity, I am relieved to know that she is able to tolerate at least some egg. Her allergist instructed me to give her some egg over the next few days and see how she does. Wow. A little weight just lifted off of me. A little, but still. I'll keep you posted. 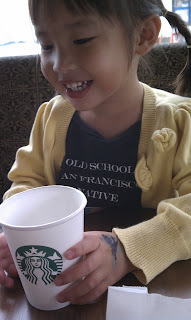 Oh, and here she is with her reward for all that waiting around. Her very own coffee cup filled with water alongside a cheese and tomato sandwich. And for me, a much needed tall soy white mocha with light whip. Perfect. My eldest, Ryken, is in his fourth week of first grade. So far the transition to a longer day (with lunch! ), a new school, and learning in Spanish and English has gone as well as I could have hoped. I am thankful to the wonderful staff at his school for making our family feel welcome and safe from the very start! If you didn't think that a principal, a school nurse, or teachers could make a big difference in a student's life, our experience has proved they sure can. At the end of the previous school year before summer vacation for teachers and staff, I emailed the school nurse and principal with details about Ryken's food allergies and history of reactions. The school nurse was especially grateful to have this information in advance so that she could put Ryken on her radar for the new school year. Fast forward to August registration -- our day to pick up teacher assignments, sign up for PTA, and all that jazz. I stopped by the main office to turn in our doctor-completed Food Allergy Action Plan , some more detailed instructions and a personalized letter, and emergency medications. We saw the school secretary and principal who both remembered Ryken by name and welcomed him to the school. Ryken was so shocked that he was recognized. I could tell it made him feel like a rock star! Another secretary made copies of the FAAP, letters, and instructions for the school nurse and both Ryken's English and Spanish teachers. Three days later I received an email from Ryken's English teachers. She thanked me for my information and wanted Ryken and me to meet with the first grade team before the school year began. As it turns out, his English teacher has a child who has had to carry an Epi-pen since elementary school -- she completely understood my fears! So the day before school, Ryken got to meet his teachers, I talked with them about the severity of his allergies, and we agreed on having all kids using hand sanitizer after recess and wet wipes after lunch to try to avoid contact allergies. And Ryken would be washing before any eating time, a practice he normally does. On our way out of the meeting, we ran into one of the Kindergarten teachers who recognized Ryken and gave us a warm welcome to the school. I had never met the teacher before so I assume the staff had recently been briefed on students requiring possible emergency medications such as Epi-pens and inhalers. Glad I popped a picture of Ryken on his FAAP and my personal directions! On the second day of school the principal checked in with me. He told me he was halfway through the online anaphylaxis training course for educators that I had forwarded to him. 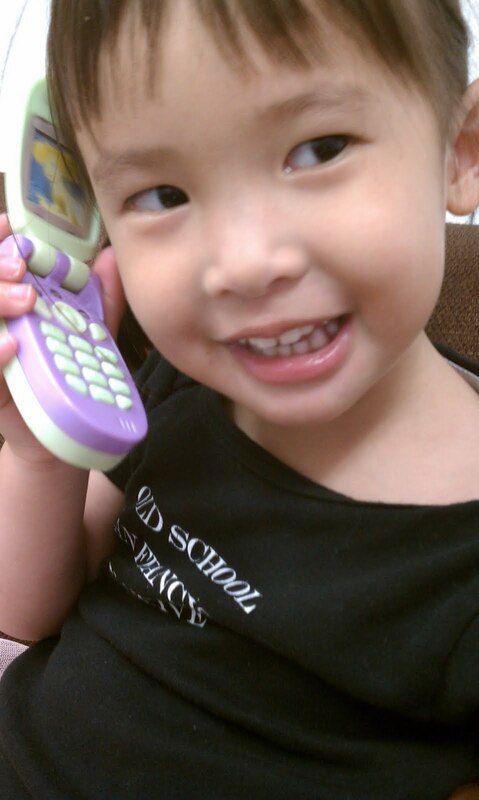 He also wanted to check in with me to see how Ryken's transition was going. I mentioned that Ryken said he didn't know when or where he could wash his hands after lunch recess (at his school, playtime is first and then kids walk directly to the lunchroom for a 15-minute lunch). The principal gave us a quick, personal tour of how the kids would walk from yard to lunchroom, showed Ryken where he could break off for a bathroom detour and how to take a shortcut back into the lunchroom. Ryken hasn't missed a handwashing since! It became clear to the observant lunch staff and principal that Ryken was surrounded by potential risks at his tightly packed class lunch table. The school did not have a nut-free lunch table previously but one was set up a couple days after the start of school. Ryken feels much safer now! The school nurse sent me a warm email to welcome us to school and invited us to stop by at any time. I visited her at the end of the first week of school when we discussed what I thought would be the best way to inform class parents about Ryken's food allergies. The school nurse had a form letter about severe nut allergies. I drafted a letter about Ryken's situation (which included talking about his severe milk allergy and his suspected kiwi allergy). I thought there were pros and cons of sending the official school letter versus my personal letter. In the end, I let the teachers decide what they felt would be most effective without inundating the parents, many of whom are fluent in Spanish but not in English. The teachers distributed the school's nut allergies letter. At Back to School Night they also reiterated that a student has severe food allergies and parents *should not* pack nut products in lunches or bring any food treats for birthdays. My younger son started preschool this week. Over the summer, I informed his teachers about his allergies, which are very similar to their old student's, Ryken's. :) His teachers continue their nut-free policy and strict handwashing before school and before/after eating. They will only serve dairy-free food snacks on his attendance days. They do serve cow's milk but always offer soy milk as an alternative and do so in a clearly marked pitcher. I received my FAST posters from Food Anaphylaxis Canada and have given them to both my kids' teachers. Hope to see these up in the classrooms and lunch areas. Even though staff receive Epi-Pen training, these FAST posters are helpful as quick reminders of symptoms for trained staff as well as less allergy-aware parent volunteers. 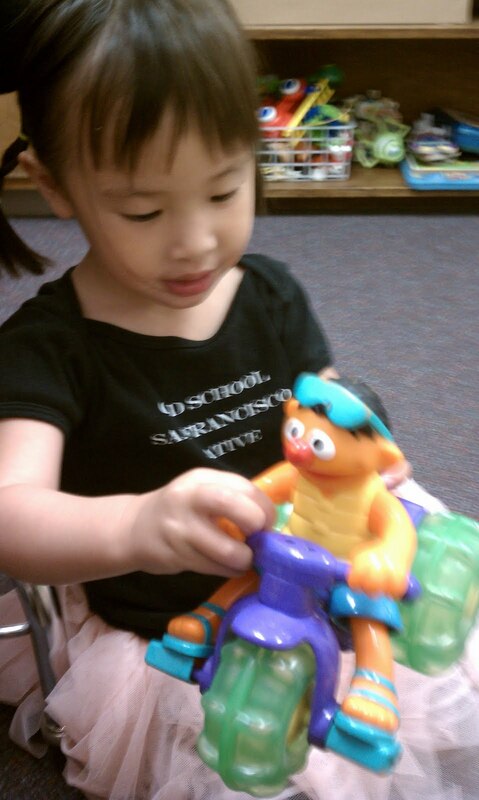 Overall, I feel really lucky that both of my kids' schools have been very receptive to my concerns. This should be the norm but I know it is not. Ryken felt nervous those first days of school especially in the lunchroom and when a classmate's mom appeared with heavily frosted cupcakes. Since then, with the disclosure of his allergies to the class, the nut-free table added, daily wet wipes for everyone, nut-free signs outside the class, and simply being shown where the nearest bathroom to the lunchroom is, I feel like Ryken is thinking more about recess play and figuring out what his Spanish teacher is saying -- you know, the things that a non-food-allergic kid in his situation should be concerned about. I will definitely pipe up if I feel like more needs to be done to protect the kids from milk contact and if "no sweets in the class"policy is starting to slide. So far, I am really impressed with the prompt and sensitive responses we have received from all levels of staff at the schools. Do you have a child in school this year? Share with us some positive experiences you've had in your school community! Yet another Pacific Grove post. Can you tell how much I loved living there over the summer? I actually discovered Happy Girl Kitchen Company after finding out that they sell Blue Bottle Coffee, and well, I needed my coffee fix. I found out that they are SO much more than coffee--this place is amazing! They have a food preservation community complete with classes, newsletters, and a Food Preservationists' Bulk Purchase Program with pick-up locations all around the Bay Area and Central Coast. At their PG location, they also offer baking workshops and a fantastic selection of delicious jams and other preserved foods. Sorry, this photo is not doing this delicious berry scone justice. The perfect way to start your day in PG. Just a few blocks away from the Monterey Bay Aquarium, wake up a little early and have yourself a proper breakfast before venturing out with the kids! Yes, Tristan is a huge Star Wars fan. I'm sure there's a word for people like him but not being one of them, I don't know what that is. He calls himself a Jedi Master so maybe it's something like that. For his birthday, Tristan invited a bunch of friends to a private screening of Star Wars at a local theater. The ticket came with popcorn and a drink (which ended up being water because a 10 am soda was just wrong in so many ways), and then I baked ten dozen dairy/egg/nut-free chocolate chip cookies to share. I actually didn't even anticipate that Tristan and some other dairy-allergic children would be able to partake in the movie theater popcorn, but then again I hadn't seen a movie in so long, I couldn't tell you the title of a single movie that's been released in the last 12 months, let alone what's in the popcorn. But alas, just canola oil and a sprinkle of salt in this theater's popcorn. Yay! I was so excited about Tristan's first time eating movie theater popcorn, I almost forgot all about the movie. Anyhow, I just wanted to post this idea for others because not only was it allergy-friendly and tons of fun, it was SO easy for me. And with so much on my plate lately, I was thankful for it. 1. Hit up your local theater first to see if they'll accomodate you. Our local theater has been around for decades, they're family-owned, and was happy to help us make arrangements. 2. Plan for a pretty early party: they scheduled us before the matinee so that no one else would be in the theater. Perfect for a bunch of noisy kids, but next time, I'm bringing the coffee! 3. Ask and ask again about what's in the popcorn: what oil they use to pop it in, and what they add to it. The fact is, most of the buttery toppings that are added to movie theater popcorn actually have no dairy--it's all artificial butter flavor. But please double check. So many thank you's to Four Star Theater for making Tristan's favorite movie come alive on the big screen! We love you guys! A couple years after college, in a conversation with my boyfriend/now husband about the good ol' days of dorm food (I am being sarcastic here), we agreed that the dining commons had at least one redeeming feature: blondie bars. Not to be mistaken with this Blondie or that Blondie both of which I came to love in college, too. No, the blondies I'm talking about for this blog were vanilla brownies. Like sushi, Thai food, and a host of other non-Chinese eats, I had never tasted or even heard of a blondie before college but once I tried one, I was sold. Memory unearthed and new obsession seeded, finding a great blondie recipe became my next goal. And find one I did! Blondie bars became one of the usuals on my baking circuit. I loved making them because they were a change from the usual chocolate chip cookie -- my other go-to dessert -- and friends loved them. Even though my kids are milk-allergic, I can continue to make blondies by using vegan margarine and dairy-free chocolate chips. But through my interest in reducing my wheat intake, I stumbled upon Chocolate-Covered Katie's take on blondie bars using garbanzo beans. Below is my slightly different take on Katie's blondies. Our family of four found ourselves quickly devouring these (okay, okay...it was mostly me) so I more than doubled the recipe. I added a little water because I was having a hard time breaking down my garbanzos with an immersion blender. I think the added liquid helps to lighten up the blondies. I also changed the quantity and type of sugar because I think the chocolate chips more than make up for the sweet goodness. I like to boil my own garbanzo beans instead of using prepared, canned beans since they are often made with bisphenol-A (BPA), a potentially toxic chemical that can leech into the food from containers. I usually prepare a huge batch and freeze any leftover beans for future use. For the smoothest texture, be sure to boil them until they are tender enough to be easily mashed with a fork. Preheat oven to 350F. Prepare a 13"x9" baking pan with foil or oil. Using a fork or potato masher, mash garbanzo beans a couple cups at a time. This will lessen the chunks for your blender or processor and make it easier to blend your batter smoothly. Once you've prepped the beans, put them in a blender or food processor. Add water and vanilla. Blend until most chunks are broken down. Add sunflower seed butter and sugar to mix. Blend until well combined. If the mixture is too thick, add a teaspoon more of water. Add remaining ingredients except for the chocolate chips. Blend until smooth. Taste your batter. Not sweet enough? Stir in extra sugar one teaspoon at a time until you've hit your sweet spot. Stir in chocolate chips with a spoon. Spread batter evenly in pan. Bake for 38-45 minutes until inserted toothpick emerges clean and the top is golden or golden brown. Cool completely and serve. Store leftovers in the refrigerator. I like these blondies best when they've had time to chill for a few hours or overnight. The texture holds better and the chocolate and cinnamon flavors intensify -- overall, it helps to mask the beans. I don't mind the beans but if you're like my husband and not as sold on this healthier dessert, refrigerating before serving is definitely the way to go. Ryken is always impressed at how I can hide the beans. If you have food-allergic kids or teach pre-K or lower elementary grades, I highly recommend having a copy of Juniper Skinner's Food Allergies and Me in your library as the new school year gets underway. It is a terrific book for educating young children about food allergies. I liked it so much I'm working on getting our local library to order copies for its parent resources collection! I found the book's simple language and amount of information to be perfect for my 3-year-old who knows that he has food allergies but still isn't always so savvy enough to avoid potentially dangerous situations. Having already heard the story, Callan's understanding grows by reviewing the pictures. The book was helpful to my veteran 6-year-old because it reiterates very important rules: never share food, always have mom, dad, or a qualified caregiver check labels, and always tell a grown-up right away if you feel sick. I also appreciate how the boy's allergies are presented as simply one aspect of his life. Everyone -- allergies or not -- is different in some way. Kids must "investigate" with adult assistance in order to be sure a food is safe. Last thing, I love that the book was written in first person. Very kid-friendly and read like a true story. It resonated with my kids because it is a reflection of their lives with food allergies. Author Juniper Skinner is a mom of two kids, one of whom has multiple food, dander, and pollen allergies. To find out more about the woman and kids behind the book, check out Juniper's witty blog, This Little Piggy Went to Farmers Market.